Join us for a discussion with Barayuwa Mununggurr and Gunybi Ganambarr, artists from the Northern Territory of Australia. 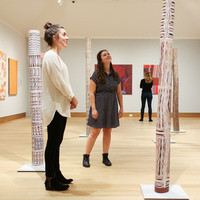 University of Virginia and guest curator of the current installation of Indigenous Australian art in Hall Gallery. The discussion will begin in the Hood Museum of Art auditorium and conclude in the upstairs galleries. This program has been made possible by the Owen and Wagner Collection of Indigenous Australian Art Endowment.